Brown sugar is a delightful addition to many baked goods and also enhances simple food like oatmeal. But, once you've opened the box, it can turn into a hard and useless mass in barely any time at all. Don't panic and go out and buy another box. Instead, you can soften it up so it's good as new with one of these three simple tricks. If you are going to use brown sugar in a recipe and your brown sugar in the pantry is already open, it's a good idea to check its condition a few days before you plan to use it. If it's hard, place a few apple slices (or a slice of bread) in an air-tight container with the brown sugar. Then remove the apple slices or bread when the sugar has softened. You can also place the brown sugar in a bowl, cover it with a damp cloth, and let it sit overnight. By the time you need to cook with the sugar, it should be a perfect consistency for measuring it out. If you've decided that you just have to make some cookies that call for brown sugar right this minute, or you want brown sugar to sweeten your oatmeal, place the brown sugar in a microwave-safe bowl and cover it with a damp paper towel. Microwave the sugar in 20-second increments until it is soft. You can use your fingers or a fork to soften any clumps that remain. When it's done, the sugar will be hot so be sure to handle it carefully. Spend a few dollars on a brown sugar saver, which is a small piece of terra cotta stone that you wet and put into your brown sugar canister. This baker's trick works because terracotta is porous and it holds moisture for a really long time when it's placed in an air-tight container. In fact, you only need to wet it once every few months in order to keep your brown sugar soft. And, you can Buy a Brown Sugar Saver on Amazon without leaving the comfort of your home. A brown sugar keeper, made by Progressive, is a BPA-free container with a tight-sealing gasket and has a spot on the underside of the lid for a terra cotta disc, which is included. It holds two pounds of brown sugar so it's a good size for the job. Having a special place for the terra cotta disc so that it doesn't sit directly in the brown sugar makes it easier to scoop out the sugar and also avoids the problem of the brown sugar sticking to the disc, which can occur when the disc is resting in the sugar. 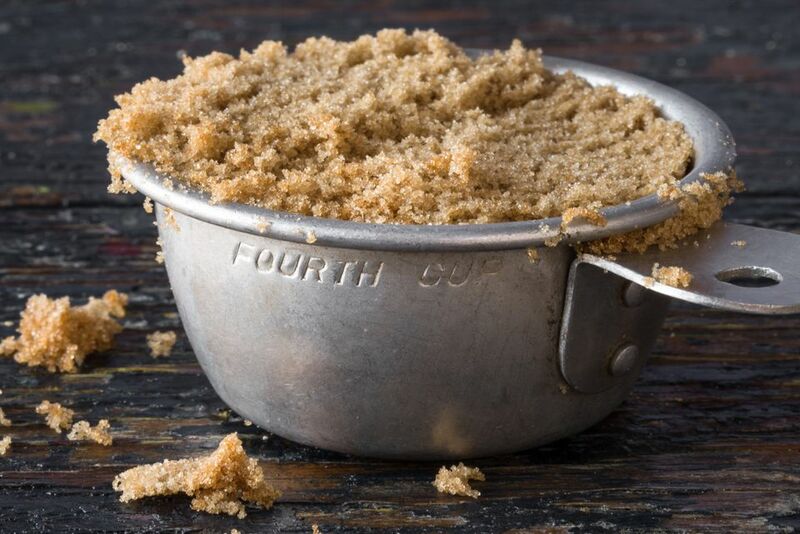 Now that you know how to soften hard brown sugar, you just need to learn how to make your own brown sugar (using white sugar and molasses) and brown sugar substitute for those times when you run out. A little kitchen know-how can eliminate quite a few trips to the grocery store—or spending money you don't need to. You might be wondering why brown sugar hardens so quickly. It's not because you purchased a box that's been sitting on the shelf for too long. The moisture in brown sugar evaporates much faster than in other similar products and causes the sugar to harden. To remedy this problem, you just need to try any one of these tricks. You can either restore the moisture content or prevent it from evaporating in the first place.